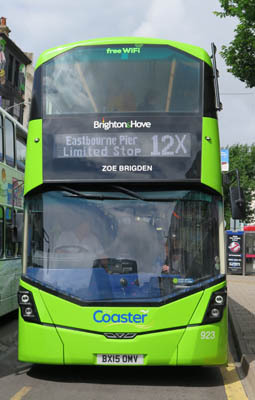 Connections with Brighton and Hove : Many entertainers pleased crowds during the best days of the West Pier in Brighton and among the most notable was Zoe Brigden. Born in 1891, she was swimming champion of Brighton, turning professional in 1913. She performed at the West Pier doing spectacular dives until retiring in 1925 to open a hairdressing salon in Whitehawk. She was famous for her Wooden Soldier dive from the pier which involved plunging into the sea with her arms by her sides and regularly entertained the public with her aquatic exhibitions Brigden would dive from a high board on the pier and occasionally perform feats from a raft in the sea. When landing stages were added to the pier, she would entertain people with swimming exhibitions in the water there Zoe Brigden thought nothing of swimming from the West Pier to the Palace Pier and her long dives contained an element of danger. She often performed with other pier entertainers She lived her later life in Roedale Road Brighton with her sister Addy and later moved to Seaford to live with her son John. 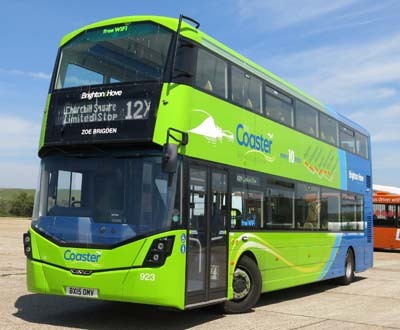 923 Mercedes Streetdeck - carried name since delivery in March 2015 on Coaster Route 12.